Our sheep have strayed from the fold. 我々の羊は群れからはぐれてしまった. Don't let the children stray into the woods. 子供たちを森の中に迷い込ませるな. a stray sheep 迷い出た羊; 迷える羊 《人》. (a) stray hair (1 本の)ほつれ毛. Let's walk hand in hand so as not to stray from each other. 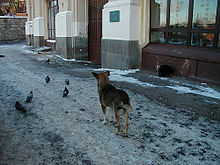 A stray dog wanders the streets. From Middle English, from Old French estraier (verb), and estrai (noun), from Vulgar Latin via strata, paved road. Any domestic animal that has no enclosure, or its proper place and company, and wanders at large, or is lost; an estray. (figuratively) One who is lost, either literally or metaphorically. The act of wandering or going astray. (historical) An area of common land or place administered for the use of general domestic animals, i.e. "the stray"
(intransitive) To wander, as from a direct course; to deviate, or go out of the way. (intransitive) To wander from one's limits; to rove or roam at large; to go astray. (intransitive, figuratively) To wander from the path of duty or rectitude; to err. It was a derby that left Manchester United a long way back in Manchester City’s wing-mirrors and, in the worst moments, straying dangerously close to being their own worst enemy. (transitive) To cause to stray. The alley is full of stray cats rummaging through the garbage. In the wrong place; misplaced.